We sit in the middle of an invisible war. Are we going to run society by rules and force or by laws and price? Documenting the emergence of a complex global rules based system is not easy to do. Wood has done us a remarkable service by attempting to integrate the various systems into a comprehensive overview. For many years I have struggled to explain to financial professionals that the leadership does not want free markets – they want to communicate information through controlled networks rather than through prices. As long as the debt growth model could grow, an infinite amount of zero cost capital could paper over a society managed by command and control – albeit with highly sophisticated information systems, analytics and artificial intelligence. One of the challenges of building a rules based model is that it does not permit the healthy communication, competition and cooperation that occurs through markets and market prices. This results in poor communication and leads to behavior contradictory to sound economic choices or choices that support healthy labor and human productivity. In part, the backlash we are watching globally is coming from people responsible for operations whose productivity is being frustrated and destroyed as well as from people whose financial health is being destroyed who can understand this is unnecessary in the face of trillions of dollars lost to corruption and waste. The technocracy model is not working. Applying more fake news, false flags and surveillance to “double down” is not making it work either. Woods points out the importance of the political and economic model being compatible with religion. This helps explain the extraordinary efforts made by those promoting the technocracy to also debase our culture, strip the sacred from our lives and promote values that support an inhuman society. A command and control society managed by powerful, invisible and invasive technology leads to microchipped people mind controlled through a “smart grid.” Instead, a market economy managed with prices will deliver the message that rings true throughout history — information and people both want to be free. 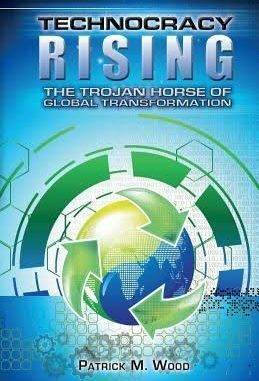 Technocracy Rising will help you understand why our governance structures have become to resemble a new form of psychopathy and why the battle unfolding in Washington at its root is about whether or not we will choose to have a human or inhuman society. The more the President-elect mentions price, the more nervous the technocrats get.